Sewing has been a life long passion. It was only natural that my love of sewing resulted in pursuing a degree in Costume Design. Now being able to combine that passion for design with sewing for the Church brings double pleasure. 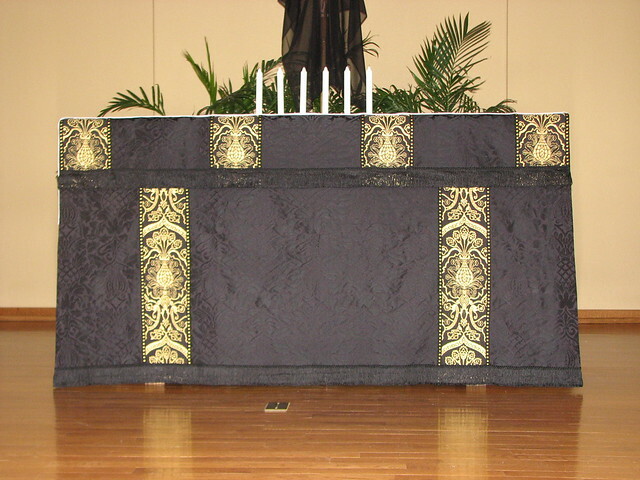 When I started making Ecclesiastical or Church Vestments, there was not much available in the way of techniques, church vestment patterns, Liturgical Embroidery Designs or Ecclesiastical Embroidery Patterns. Locating instructions for sewing altar hangings, church linens and church vestments was a struggle. It has taken years of searching and study to find the remnants of an art form that has nearly vanished. During this journey, I have met many kindred spirits who share the same passions and quest for knowledge related to Church Vestments and Vestment Making. There have been struggles to overcome and lessons learned. There is nothing quite like the joy that comes when a church vestment project, not only turns out, but turns out very well. Now it is time to share the information I have gained relating to Ecclesiastical Sewing with others. From this desire, Ecclesiastical Sewing was born. Ecclesiastical Sewing is our online store front where you may purchase liturgical fabrics, patterns, machine and hand embroidery deigns and church vestment patterns. Along the way, I hope to share photos of works in process such as chalice veils, altar frontals, pulpit falls, chasubles and pastoral or priest stoles; works I have completed including hand embroidered Ecclesiastical designs, pieces from collections I have seen, ideas and musings for future projects, techniques, and with any luck, perhaps…….well, time will tell the rest. Come along and join me on the journey. Be sure to visit our online store front Ecclesiastical Sewing where you may shop for Liturgical Fabrics, altar linen fabrics, church vestment making patterns, liturgical machine embroidery designs, church vestment trims and notions and so much more. You may also find us on Ecclesiastical Sewing on Facebook , Twitter, and Pinterest.